Lucies' Phalange Plot ring, a.k.a. 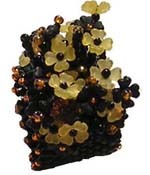 the finger garden ring is a delightful burst of color and fun for your wearing pleasure. The Phalange Plot ring kits are $15.00 and come in the seasons shown. 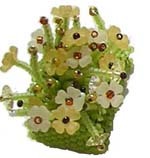 The kits contain seed beads, Lucite and marguerites. We have tested these kits and there is enough supplies to make TWO rings in each kit if you make a slimmer band. 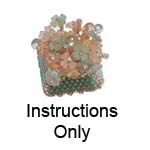 Instructions can be found in Bead Unique magazine purchasable on the Phalange Plot main page or for download. Instructions are not included in the kit. 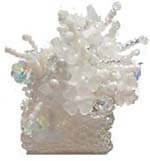 The instructions cost $3.00 and are sent via e-mail for color instructions or snail mail for black and white printed instructions. 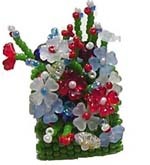 By purchasing this kit you agree that it will not be sold, distributed, or taught without permission from The Hole Bead Shoppe.